Simon W. Gerson, veteran journalist and legendary fighter for working class political representation, died on Dec. 26, 2004 in Brooklyn, N.Y., at 95. 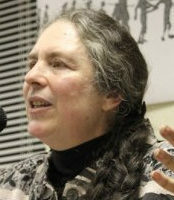 A member of the national committee of the Communist Party USA, Gerson’s activism spanned seven decades beginning in the depression era of the 1930s. Best known for his mastery of the electoral process and strategic coalition building, Si’s contributions toward independent politics have made a deep impact. “Si was a wise counselor and a tower of strength to all of us in the labor and progressive movements,” said Henry Foner, retired president of the Fur, Leather and Machine Workers Union. In the mid-1930s, during the first administration of New York City Mayor Fiorello LaGuardia, Si worked as City Hall reporter for the Daily Worker and was a member of the Newspaper Guild. In 1937 he was named executive assistant to Manhattan Borough President Stanley M. Isaacs, making history as the first publicly known Communist to hold appointive office in New York. Despite attacks and lawsuits by the American Legion to remove him, Si served in the position until 1940. In 1941, Si managed the victorious campaign of the Communist candidate Pete Cacchione who was elected to the New York City Council from Brooklyn under proportional representation. Si and Cacchione worked closely together on every issue from rent control to taxes. In 1944, Cacchione was joined on the council by Ben Davis, the Communist councilman from Harlem. On Election Day, observers were outraged at open vote theft by the Tammany Hall machine during the count. Si rushed over from the Brooklyn Armory, where he was watching Cacchione’s votes, and “compelled directors of the count to produce nearly a thousand votes for Davis which had mysteriously gone astray,” wrote political reporter Harry Raymond in the Daily Worker. During World War II, Si served as an infantryman in the South Pacific, fighting against fascism. Upon return, he plunged back into local politics. When Cacchione died in November 1947, Si was named to fill the vacancy. The Tammany machine refused, by a split vote, to seat him despite clear provisions in the city charter. Forced to run in a borough-wide race in 1948, Gerson received the endorsement of both the American Labor Party and the Communist Party, appearing on both ballot lines. He received 150,369 votes, 18,000 on the CPUSA line and 132,000 on the American Labor Party’s. It was one of the biggest votes recorded for a Communist in the Party’s history. 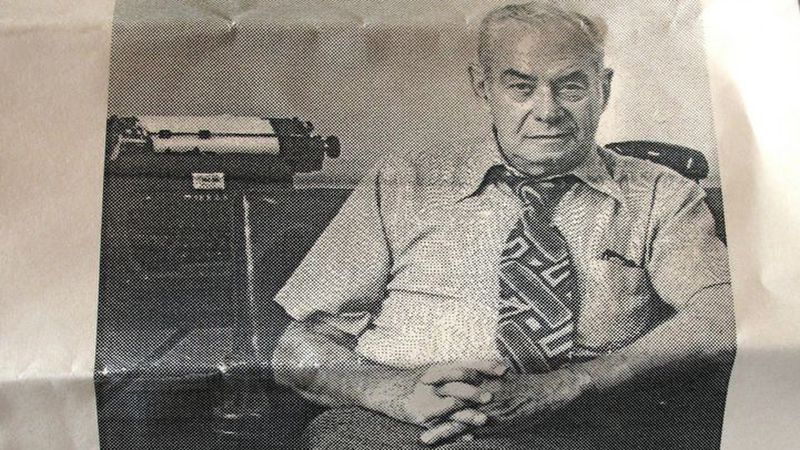 In the 1950s Si served as executive editor of the Daily Worker and in the 1960s assumed the same post with its successor, the Daily World. 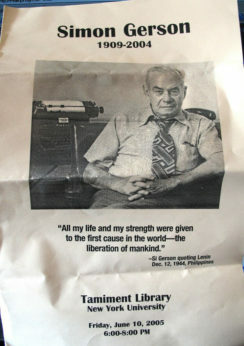 He also edited the English pages of the Communist Yiddish newspaper, Morning Freiheit, under the pen name, Will Simon. While serving as legislative head of the New York Communist Party, Si was among those arrested under the anti-Communist Smith Act, and later acquitted under judicial order that membership in the Communist Party does not violate any laws. In 1976, Si became campaign manager for the Communist presidential ticket of Gus Hall and Jarvis Tyner and continued to serve as chair of the Party’s political action commission for many years. During those campaigns, the Party was instrumental in successfully challenging restrictive ballot access laws in many states, including Connecticut where we took our case all the way to the state Supreme Court. “He taught so many of us how to build an independent political movement, but not in isolation of those still within the Democratic Party,” recalled Tyner, now CPUSA executive vice chairman. “Si lived the great left upsurge of the 30s and 40s, which turned mass movements into electoral victories. He maintained a good understanding of how to build Black-Brown-and-white unity along with political independence and how to keep your eye on the grass roots,” Tyner said. Si gave counsel and advice to many, including this writer, when I ran for Congress and mayor in New Haven on the Communist Party ticket in the 70s and 80s. Our campaign included far-reaching demands like workers’ rights to stop plant closures and runaway shops, taxing the rich and affirmative action. And we won small victories like extending the required advance notice before utility shutoffs. We maintained minor party ballot status and won wide respect. Through those whirlwind years, Si never hesitated to travel up the highway and lend his expertise on campaign strategy, or help with a press release, position paper or fund appeal. As a Communist legislative representative, he testified before city, state and congressional committees. He traveled the country encouraging activists to run for office, and served as secretary of the Coalition for Free and Open Elections. He was an expert on electoral reform to open up space for independent candidates and parties, and was dedicated to building a movement for proportional representation and instant runoff voting, and to reduce the huge number of signatures and other onerous requirements that make it difficult for third parties to get on the ballot. “Si was a model for the way Communists should work — he had working relationships and friendships with all kinds of people, and a deep appreciation for democracy and for the importance of electoral politics,” New York Communist Party Chairperson Elena Mora said. Si was born in New York in 1909 and attended City College of New York in the 1920s where he met Sophie Melvin. Both were active in the Young Communist League. In 1929, Sophie hitchhiked to Gastonia, N.C. to join in solidarity with the striking Loray Textile workers. The mill owners attempted to frame Sophie and 14 others on murder charges. Si rushed to Gastonia to join in the defense of the Gastonia 15, a victory won with a worldwide solidarity movement. Si and Sophie were married in 1932. At their 70th wedding anniversary celebration in 2002, Joe Walker, former editor of Muhammad Speaks, recalled his friendship with the Gersons dating from the struggle to end the Vietnam War and to free Angela Davis. “In all the years I have known them, they never attempted to sidestep a struggle for justice,” Walker said. When Si was editor of The Worker and later the Daily World, Tim Wheeler was Washington correspondent. He frequently visited the Gerson home when he traveled to New York, and enjoyed Sophie’s gourmet cooking. Si is survived by Sophie; daughter Deborah, a sociology professor at San Francisco State University, and two granddaughters, Timi Gerson and Frieda B.K. Gerson. Son Bill died in October 2004. Speaking at their 70th anniversary, Timi praised her parents and grandparents for instilling in her a passion for equality and justice.